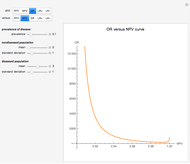 This Demonstration examines the relation of pairs of accuracy measures of diagnostic tests applied on normally distributed nondiseased and diseased populations. This is done for differing prevalence of the disease, taking into account the means and standard deviations of the populations. 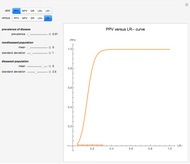 The means and standard deviations are expressed in arbitrary units. 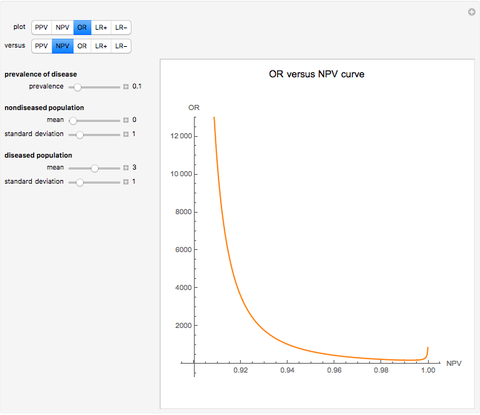 The measures considered are the positive predictive value ("PPV"), the negative predictive value ("NPV"), the (diagnostic) odds ratio ("OR"), the likelihood ratio for a positive result ("LR+") and the likelihood ratio for a negative result ("LR-"). 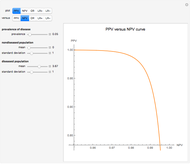 The measures can be selected by clicking the respective "plot" and "versus" buttons. 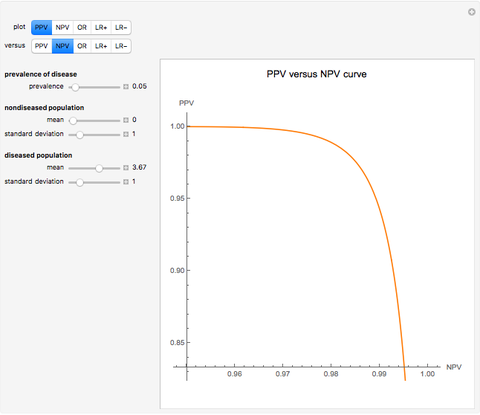 Given a diseased and a nondiseased population, the specificity can be defined as a function of sensitivity; therefore, we can generate the parametric plots of any pair of the diagnostic accuracy measures. To the best of our knowledge, with the exception of the pair PPV and NPV [1, 2], the relation of any other pair of the given diagnostic accuracy measures has not been discussed in the literature. In the thumbnail, the population data describes a bimodal distribution of serum glucose measurements in nondiabetic and diabetic populations . This Demonstration is an extended version of another Demonstration , first published in 2015, and is appropriate as an educational tool for medical students and as an exploratory research tool in diagnostic accuracy studies. S.-Y. Shiu and C. Gatsonis, "The Predictive Receiver Operating Characteristic Curve for the Joint Assessment of the Positive and Negative Predictive Values," Philosophical Transactions of the Royal Society A: Mathematical, Physical and Engineering Sciences, 366(1874), 2008 pp. 2313–2333. doi:10.1098/rsta.2008.0043. T. Chatzimichail. 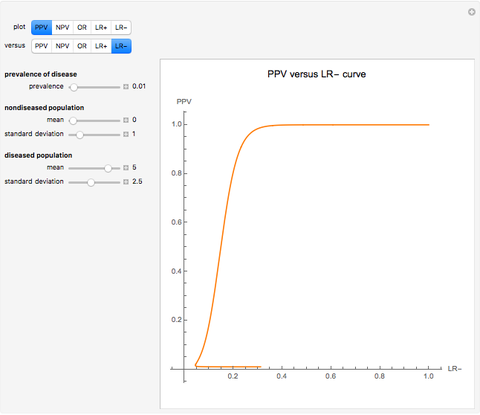 "Correlation of Positive and Negative Predictive Values of Diagnostic Tests" from the Wolfram Demonstrations Project—A Wolfram Web Resource. demonstrations.wolfram.com/CorrelationOfPositiveAndNegativePredictiveValuesOfDiagnostic. T.-O. Lim, R. Bakri, Z. Morad and M. A. Hamid, "Bimodality in Blood Glucose Distribution: Is It Universal?," Diabetes Care, 25(12), 2002 pp. 2212–2217. doi:10.2337/diacare.25.12.2212. Theodora Chatzimichail and Aristides T. Hatjimihail "Relation of Diagnostic Accuracy Measures"